Morro Bay lies along the central California Coast near San Luis Obispo, and is known for two major landmarks: Morro Rock, a large volcanic dome right near the shoreline, and a power plant with three very tall smokestacks. 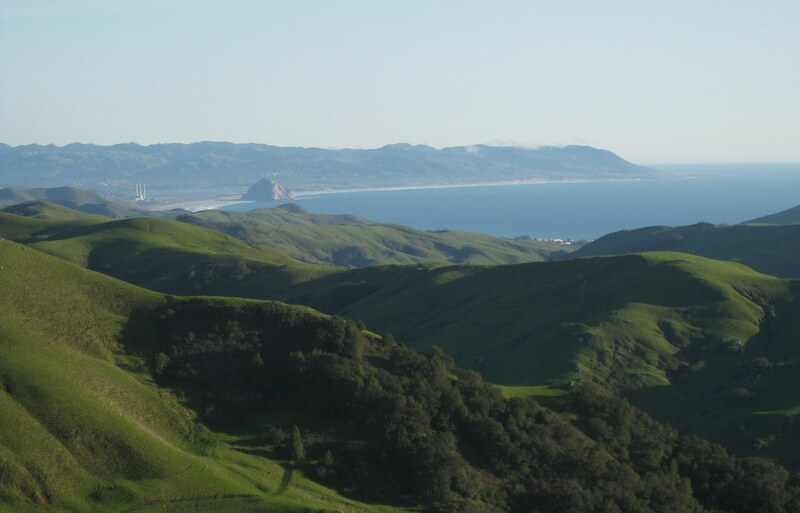 Some miles north, Highway 46 cuts through the coastal mountains from Cambria to Paso Robles, revealing cattle ranches, wineries, and empty hills. There’s one spot along the road where the hills part, revealing a perfect view of the bay and the rock. Better yet, there’s a turnout, making it easy to stop and look. The first time I drove this way, it was gray and overcast, and might actually have been raining. A year later I took the same drive again on an sunny day, unable to remember how far along the turnout was but watching for it the whole way. The result: this shot. The curves of the dome, the bay, the rolling hills and the patch of heavier vegetation all fit in with this week’s photo challenge theme. It is a perfect choice for this week’s challenge! You did a great job of capturing the beauty of your drive. What a gorgeous shot of the rolling (curvy) hills and the bay. Just lovely.